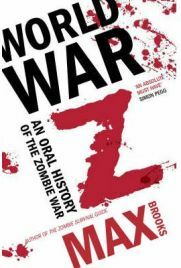 As a big fan of George A Romero’s classic zombie films (the original trilogy primarily I hasten to add) I was eager to read World War Z and, after taking a while to get into the book, I found it an imaginative addition to this ‘universe’ with a suitably apocalyptic atmosphere, literally millions of zombies, and some fun ‘alternate history’ stuff. Another interesting thing about the book is how it draws inspiration from epic accounts – and actual events – of World War 2 with huge streams of refugees, mass evacuations, battles, and countries pulling together in the face of disaster. The author seems to have a particular interest in Churchill too and several contributors mention or quote him. Oddly enough, I found the American experiences of the ‘crisis’, which naturally the author dwells on the most, to be the least interesting on the whole, possibly because it tends to dominate these types of films or books anyway. It was much more interesting at times to read about zombies overrunning Japan or North Korea rather than GI Joe Average Grunt in Brooklyn or whatever. I liked the idea here that North Korea retreated into huge underground bunkers, delighted at the chance to shut off the world further and make the population even more controlled. ‘Do they even know the war is over?,’ asks a ‘contributor’ in the book. ‘The Great Leader always wanted to be a living God, and now, as master not only of the food his people eat, the air they breathe, but the very light of their artificial suns, maybe his twisted fantasy has finally become a reality.’ In the book Japan is completely evacuated and there is an entertaining account of a Japanese computer nerd finally forced from his bedroom by a power-cut and having to navigate the tightly packed apartments and zombie dominated streets of the city – ‘I made quite a sight, shimmying down that sheet-rope in a businessman’s raincoat and Reiko’s bright, pink, vintage “Hello Kitty” schoolbag.’ There is also a fun account of a blind Ninja type character who lives in the woods slaying zombies left right and centre. I liked too the story of an Indian mountain pass being held for as long as possible as millions of zombies approach – ‘If we found ourselves unable, or unwilling, to accomplish our mission, then the Jaguar’s pilot was ordered to execute Shiva’s Wrath. Everyone in uniform had heard rumours about the secret code name for the use of thermonuclear weapons.’ I must say, I was pleased to see that Britain coped relatively well with the crisis because of our abundance of historic Castles. Perfect for setting up defensive positions! One of the most gripping stories in the book is about a group of Chinese officers and sailors who steal a nuclear submarine and make a run for it with their families and civilians on board. There is a great bit where they surface and find the seas crowded with shipping and nautical shantytowns – ‘We saw a lot of infested ships, some where the crews were still fighting for their lives, some where the dead were the only crew left. One time off Dakar, Senegal, we came across a forty-five-thousand ton luxury liner called the Nordic Empress. Our search scope’s optics were powerful enough to see every bloody handprint smeared on the ballroom’s windows, every fly that settled on the deck’s bones and flesh. Zombies were falling into the ocean, one every couple of minutes.’ There are plenty of underwater zombies in this book which is something relatively new at least. Minor quibbles? There is a lot of techno waffle in this book, which is understandable enough, but I did find the factual obsession with hardware a bit of a slog at times. The author also struggles slightly to make the different eyewitnesses – especially the US ones – distinctive at times. Perhaps too the book is not quite as epic as I thought it would be. My paperback copy is 342 pages long but, with the interview format/layout, I read it in about three days. There are also bits here and there that I found a tad jarring like an Australian character (who has a great story set on a Space Station) calling the British ‘Limeys’. He’d say ‘Poms’ surely, wouldn’t he? The book does though have a dry sense of humour at times that I enjoyed. One witness comments how a creepy British documentary about zombies fighting the army includes an instrumental version of The Smiths’ ‘How Soon Is Now?’ on the soundtrack! Overall, World War Z is a gripping and absorbing book and an inventive twist on the ‘zombie universe’ that Romero started way back in 1968. No Comments on "World War Z"